Nebuta Matsuri (ねぶた祭り) is one of the most famous and popular summer festival in Japan. It happens at Aomori from August 4 to 6. 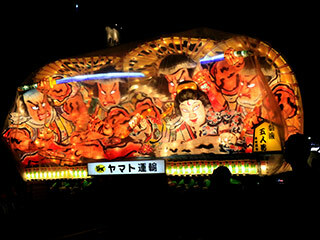 The huge paper lanturn art called Nebuta will parade at the night of Aomori. Also, traditional dancers and music players parade with the floats. There is the street regulation. Nebuta Matsuri is one of the 3 major Matsuri in Tohoku. It's held in Aomori city, Aomori Prefecture. There are 22 huge parade float with beautiful paper arts lit with a lit. Each float has the different design that takes models from Japanese myth. Also, the traditional dancers and music players parade with the floats to make the festival more exciting. The origin of Nebuta Matsuri came from Tanabata Festival. It was used to be sending off the sprits of the dead on lanterns floated on the waters of the sea. The festival starts from August 2 to 6 and at the 7th night, the parade float will travel over the sea.